Thyssenkrupp stacker and reclaimer at BHP's Mining Area C.
Thyssenkrupp Industrial Solutions has won a contract to deliver the largest rail mounted stackers and reclaimers in the world to BHP’s $4.6 billion South Flank project in the Pilbara, Western Australia. 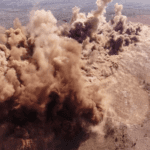 The $250 million contract will see Thyssenkrupp design, supply, construct and commission the large-scale stockyard machines at South Flank, which is being developed by BHP’s Western Australian Iron Ore (WAIO) business to produce first ore in 2021. Thyssenkrupp will supply two stackers that deposit iron ore into stockyards for loading, and a reclaimer for loading the ore into trains for transport to Port Hedland. The machines will have a capacity of 20,000 tonnes per hour, which, according to Thyssenkrupp, makes them the world’s largest rail mounted stackers and reclaimers. Thyssenkrupp chief executive officer, mining technologies, Torsten Gerlach said the engineering company would combine its longstanding global expertise in the mining business with local experience on the BHP contract. “South Flank will be one the largest iron ore operations worldwide,” Gerlach said. 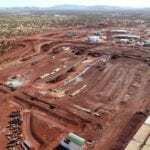 BHP is developing South Flank to produce around 80 million tonnes of iron ore a year. The project, which is on track to become BHP’s largest iron ore operation, will replace production from the Yandi mine as it nears the end of its economic life. The miner turned the first sod at South Flank in July, marking the beginning of a development that is creating thousands of jobs and opportunities for suppliers. Thyssenkrupp CEO Australia Andrew Howie said the project highlighted the company’s capability to deliver major engineering and construction projects in Western Australia. “We are focused on providing opportunities for local businesses and communities and it is exciting to see our relationship with local clients and partners continue to grow,” Howie said. 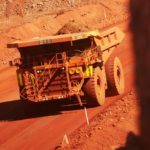 South Flank, which will have a mine life of at least 25 years, is expected to increase WAIO’s average iron ore grade from 61 per cent to 62 per cent once in production. It will also improve the proportion of lump from 25 per cent to about 35 per cent.